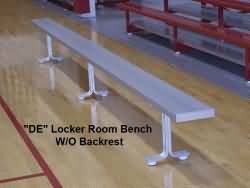 The DE series portable aluminum bench without back make a great choice for an indoor locker room bench. Footpads protect wood floors so their OK for your gym too. 6' L Portable Bench No Back (indoor)- Seats 4 - 46 lbs. 8' L Portable Bench No Back (indoor)- Seats 5 - 50 lbs. 12' L Portable Bench No Back (indoor)- Seats 8 - 62 lbs. 15' L Portable Bench No Back (indoor)- Seats 10 - 67 lbs. 21' L Portable Bench No Back (indoor)- Seats 14 - 108 lbs. 24' L Portable Bench No Back (indoor)- Seats 16 - 118 lbs.